The question that the site has been exploring over the past few weeks has been, Who opposed the Nazi’s?’ Our posts have looked at a range of sectors who opposed Nazism, some of the key individuals and will go on to explore the ways in which opposition -and Nazi reprisals – changed over the course of the Third Reich’s history. As much as we’d like to, we can’t cover everything! Here’s a list of 7 sites that we recommend for GCSE pupils wanting to find out Who opposed the Nazi’s? The History Learning Site has an great overview of opposition to the Nazi’s. It’s written by an experienced teacher and covers the main points very well. A great starting point for additional research or to look at for revision purposes. 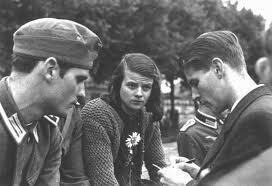 Alpha History has a section on Opposition to the Nazi’s that is a very good introduction to the role of youth resistance. It covers the Edelweiss Pirates and the White Rose movements succinctly. The Spartacus Encyclopaedia has a dedicated section on Resistance to Nazism. There are lots of useful biographies of Resistance leaders here that are ideal for extending students knowledge and understanding. The Gestapo Museum in Cologne provides examples of individuals who were arrested by the Gestapo. This gives some concrete examples of individuals who resisted and an idea of what happened to them when they were caught. Mr Walker has posted his lesson resources along with some really handy revision exercises on his website. BBC Bitesize has a good summary of opposition, some examiners tips and a short knowledge checking activity. Good for consolidation of knowledge. Last one – this pinterest list has a lot of handy links. They cover a range of issues relating to opposition to the nazi State. Excellent for taking things that bit further. Also well worth asking your class to create their own bank of links using a site such as pinterest.